Arizona (Wildcats, 28,719 students, Tuscon, AZ) 93, DUKE 77 – If N.C. State Athletic Director Debbie Yow was interested in Arizona’s head coach Sean Miller to replace Sidney Lowe, she’s even more interested now after Miller’s Wildcats demolished Duke in last night’s Sweet Sixteen West regional semi-final. Miller’s Wildcats hit the defending national champions with an second half offensive barrage that was so swift and surprising that the Blue Devils had no answer. Derrick Williams scored 25 of his career-high 32 points in the first half, and his teammates did the rest of the damage in the second frame. Showing no fear of the top-seeded Duke or their pedigreed history, the Wildcats shot 58 percent in the second half. They put on a 4-minute, 13-second dunking and driving display that led to the decisive 19-2 run. Fifth-seeded Arizona (30-7) will play Connecticut (29-9) on Saturday in the West Regional final, the Wildcats’ first such appearance since 2005. The third-seeded Huskies defeated No. 2 San Diego State 74-67 in the other semifinal. Down by six points early in the second half, the Wildcats unleashed a scoring rampage that left the Blue Devils wondering what happened. Williams scored just two points during the 19-2 run that seemingly came out of nowhere, while five of his teammates did the rest in putting the Wildcats ahead for good, 66-53. The Blue Devils were 1 of 7 from the field and committed two turnovers at the same time Arizona had its fans high-fiving and exploding in cheers. The top-seeded Blue Devils (32-5) were sent packing from a regional semifinal for the second time in three years. Coach Mike Krzyzewski, with 900 wins, will have to wait until next season to resume his pursuit of Bob Knight’s record as the winningest men’s coach in Division I history. Solomon Hill added 13 points for the Wildcats, who made 9 of 15 3-pointers, including five by Williams. Williams had 13 rebounds to help his team dominate the boards, 40-27, while playing 15 minutes from his hometown of La Mirada. Duke’s Kryie Irving scored 28 points in 31 minutes, his most since returning at the start of the NCAA tournament after missing 26 games with a toe injury. 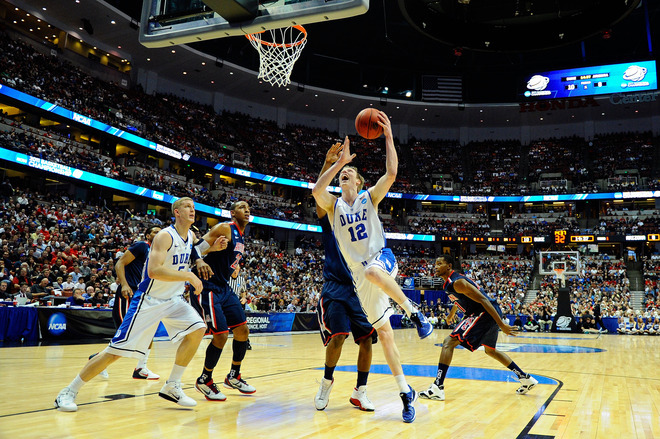 Kyle Singler added 18 as one of three Blue Devils in second-half foul trouble. 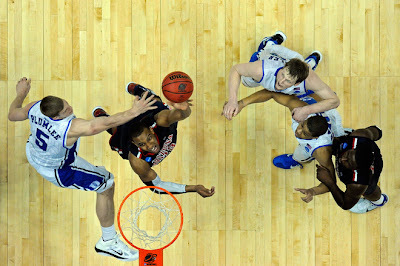 Nolan Smith was held to eight points—well under the senior’s 21-point average. Bad end to a great season. Duke got embarrassed and Uconn may lose by more. Derrick Williams is a beast. Who know's what he'll do in the NBA, but he looks like a man among boys in college. He should stay in school for at least another year to develop his already good offensive game even more, because he would be and slow small forward and a undersized power forward. He could be a better Shawn Marion. That being said, I think he can live up to Arizona's tradition of pretty good NBA players.